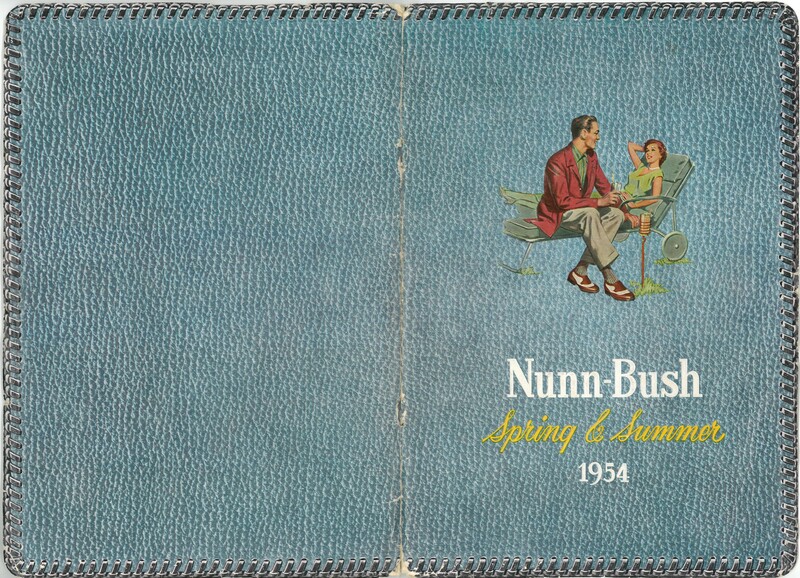 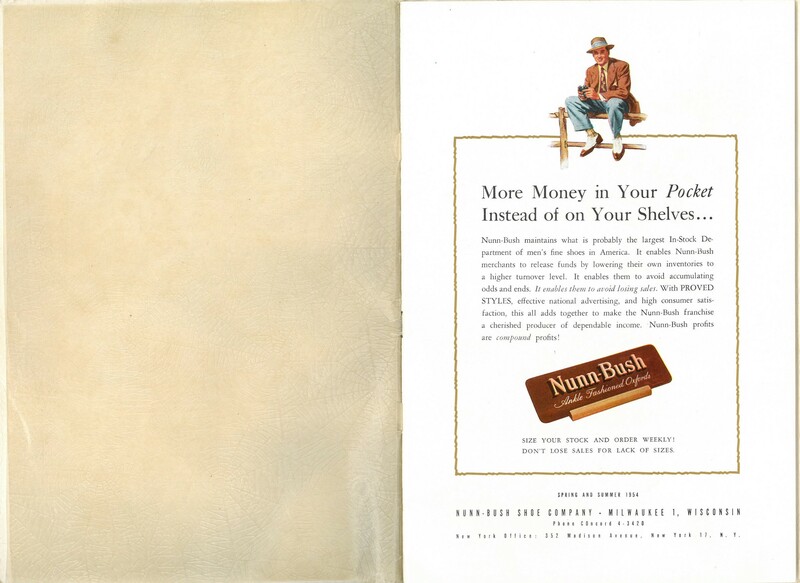 This post has scans from a superb, full color Nunn-Bush 1954 catalog that was intended for dealers and franchise owners. 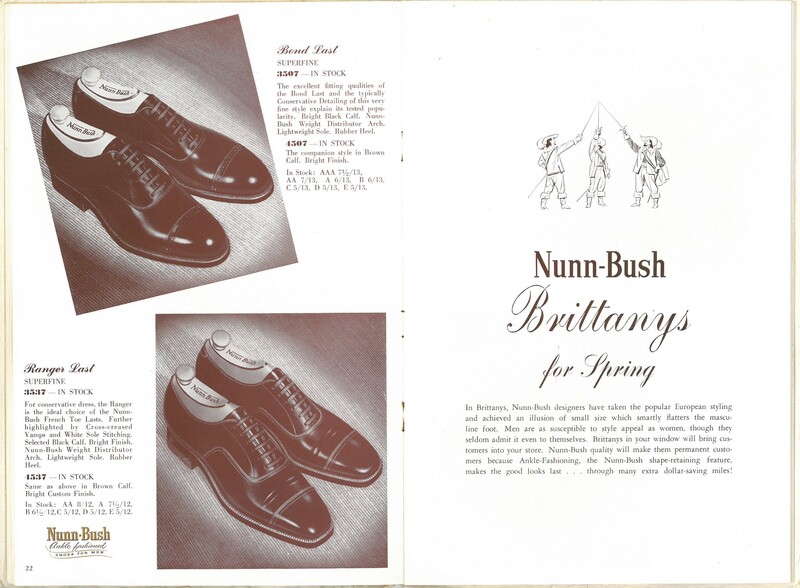 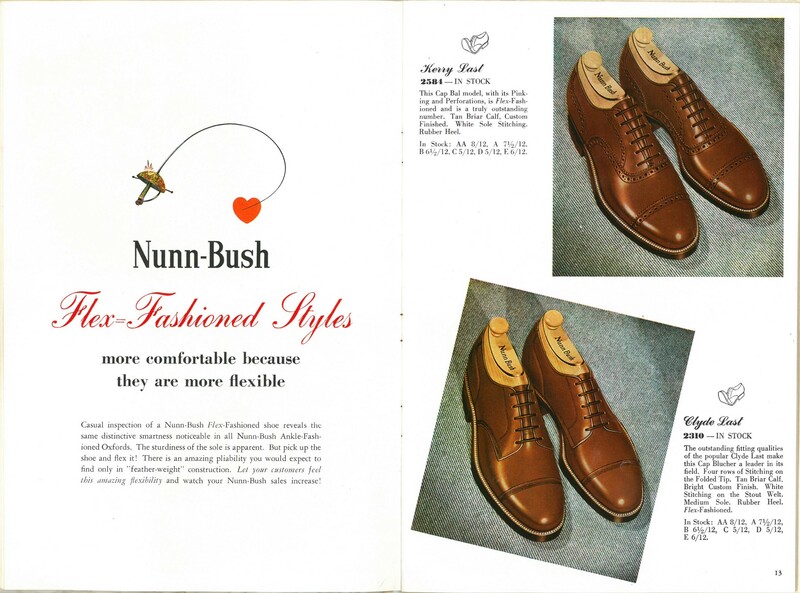 At the time, Nunn-Bush was one of the larger shoe manufacturers in the USA and was based in Milwaukee, Wisconsin. 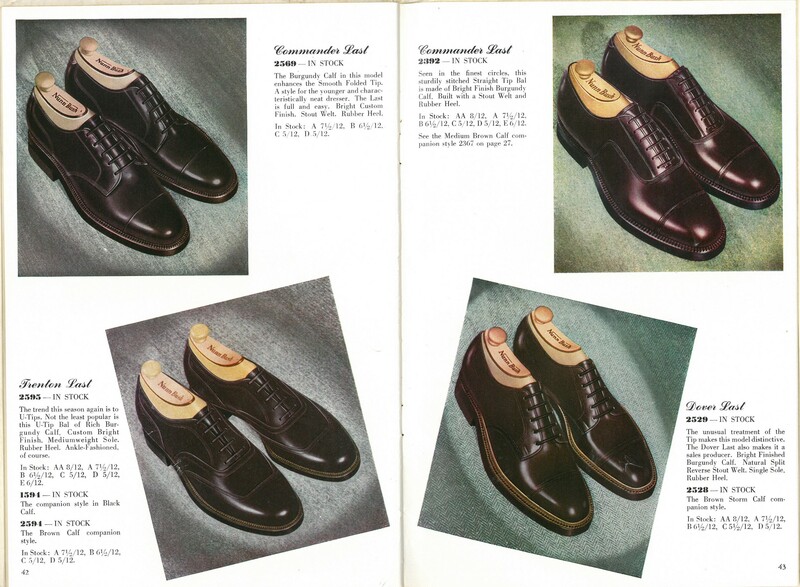 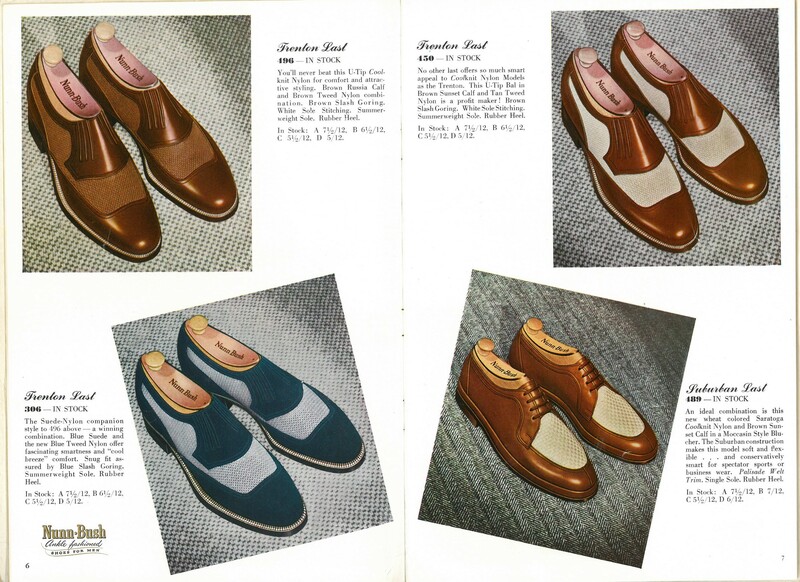 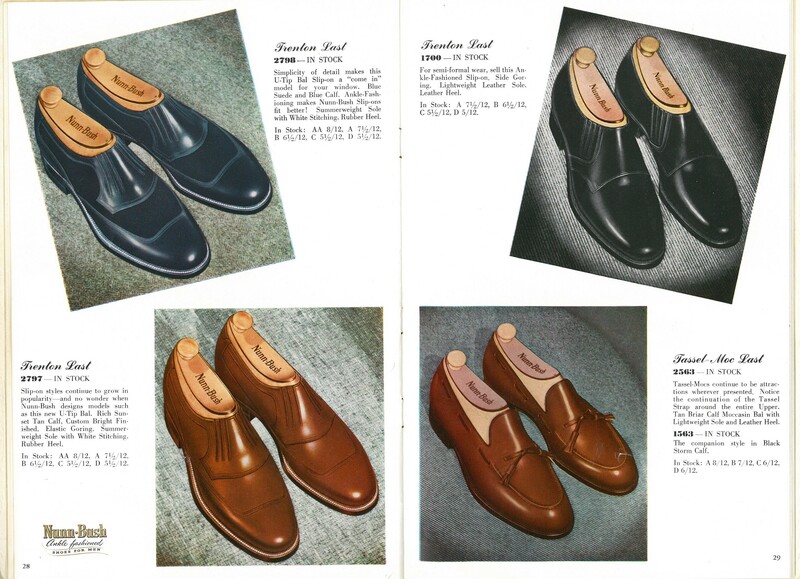 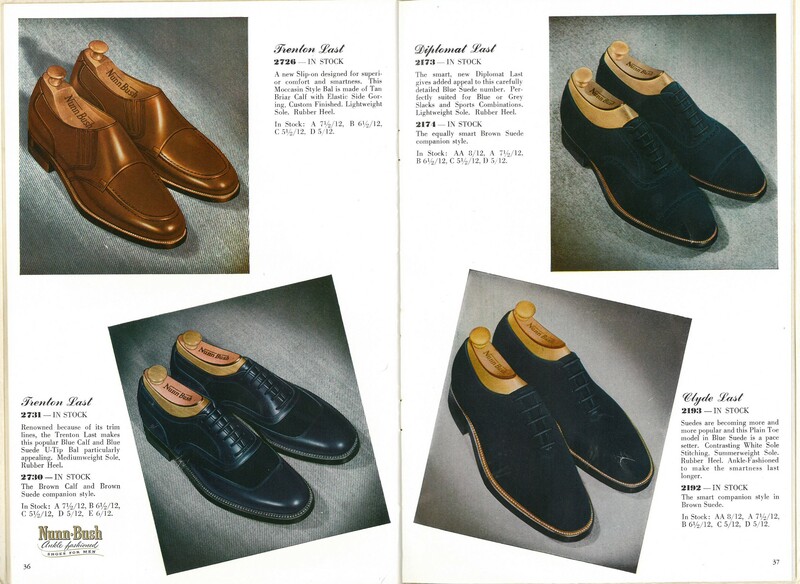 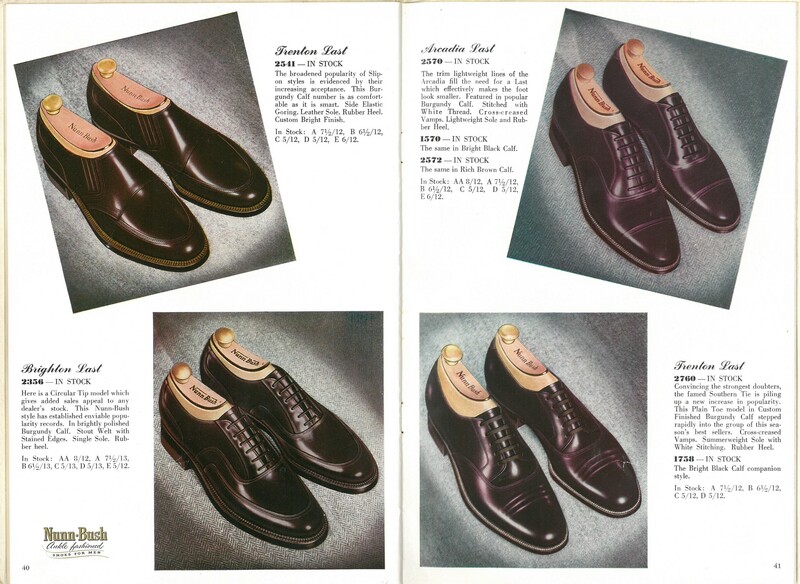 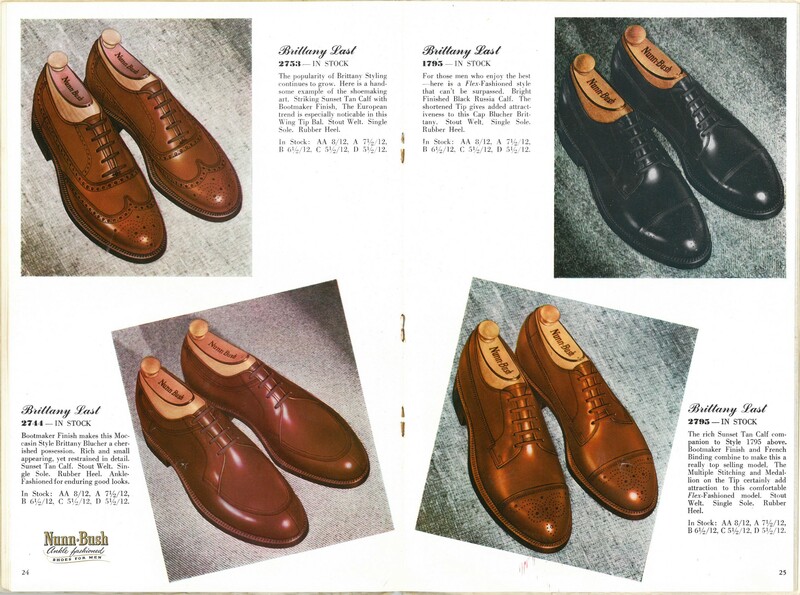 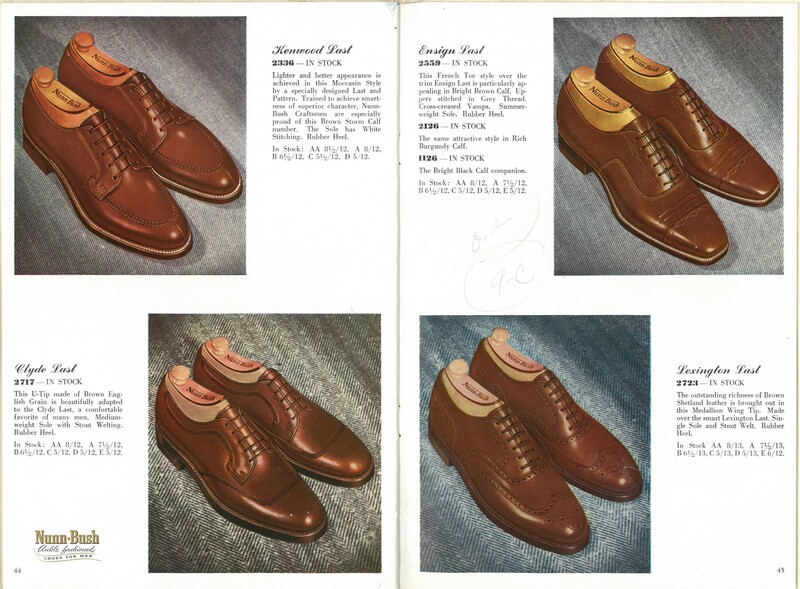 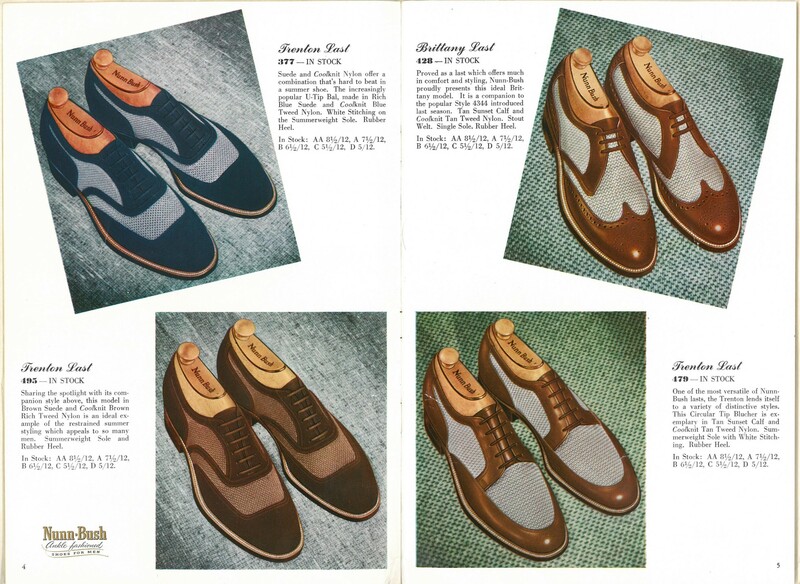 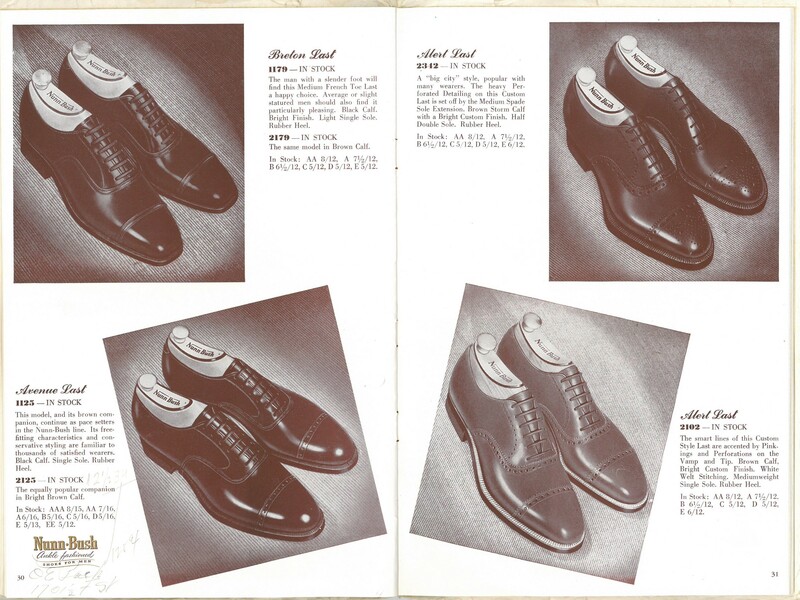 The catalog has some fanatasic images of vintage shoes from the period. 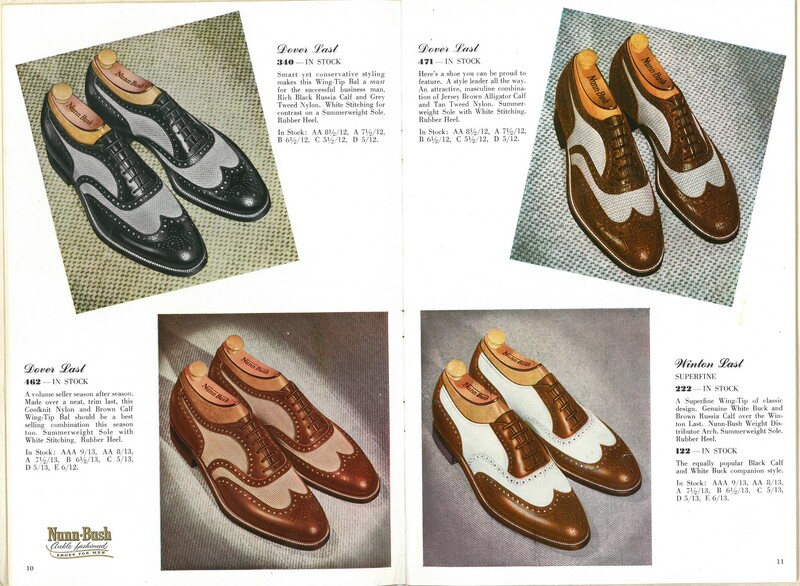 In general, the 1950s styles were more formal than the 1960s. 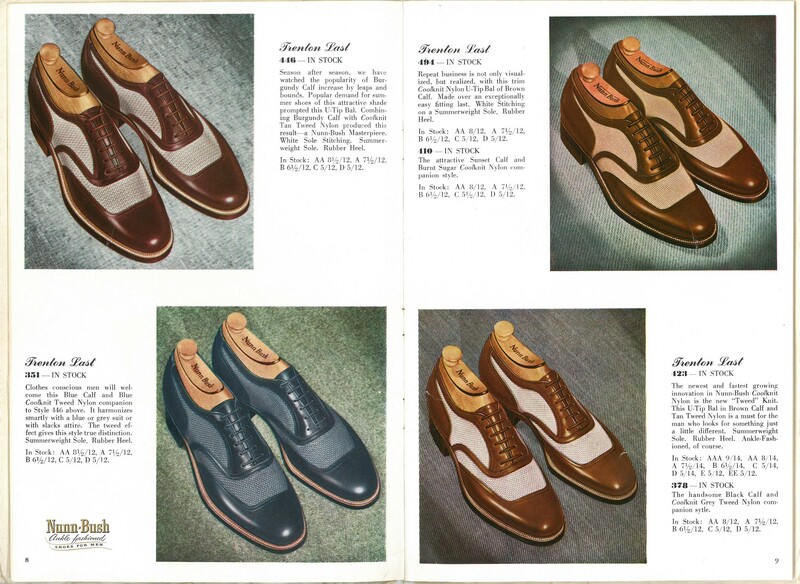 The catalog has more balmoral models than bluchers. 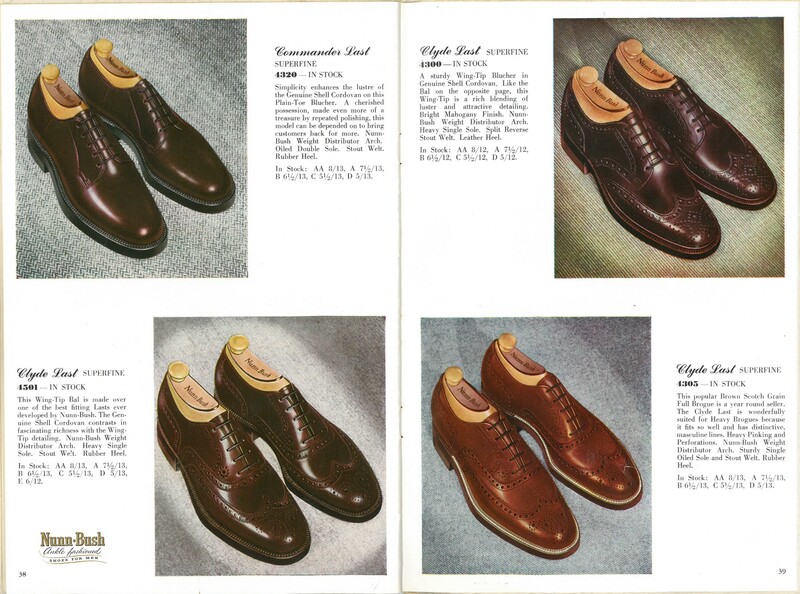 The handsome balmoral U-Tip was a popular style in the 1940s and 50s but fell out of favor by 1960. 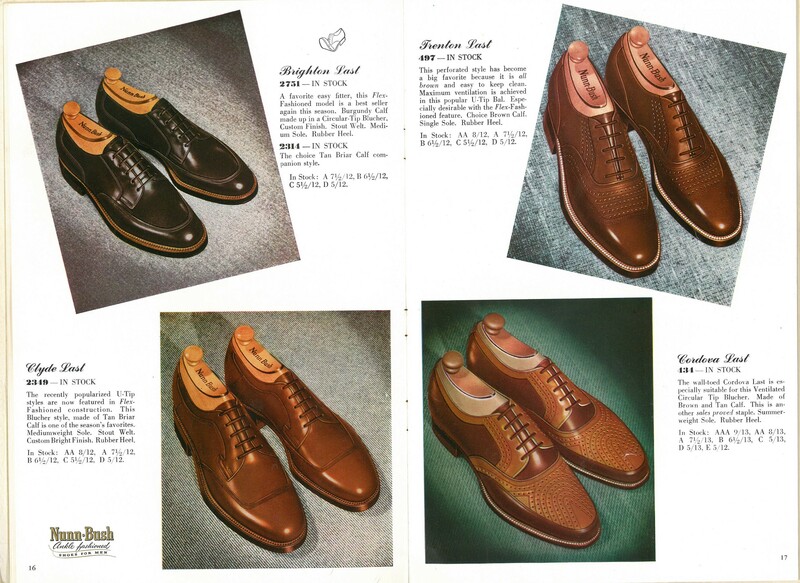 And its still out of favor with shoe buyers although the recent Allen Edmonds University model was a U-Tip (or U-Wing). 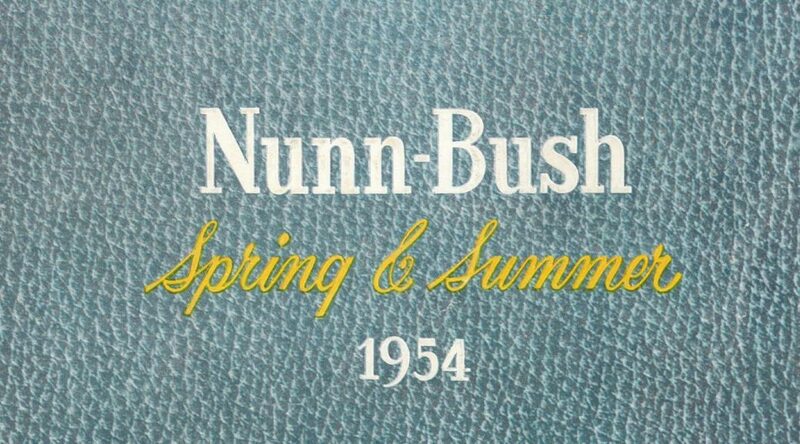 Apparently the long wing hadn’t been invented by 1954 or Nunn-Bush was just late to the party. 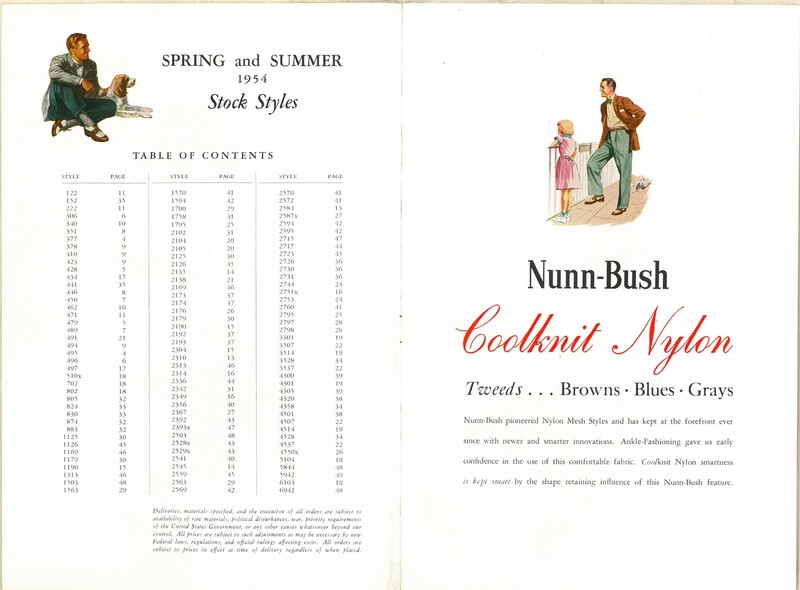 Model 830 on page 33 is close though. 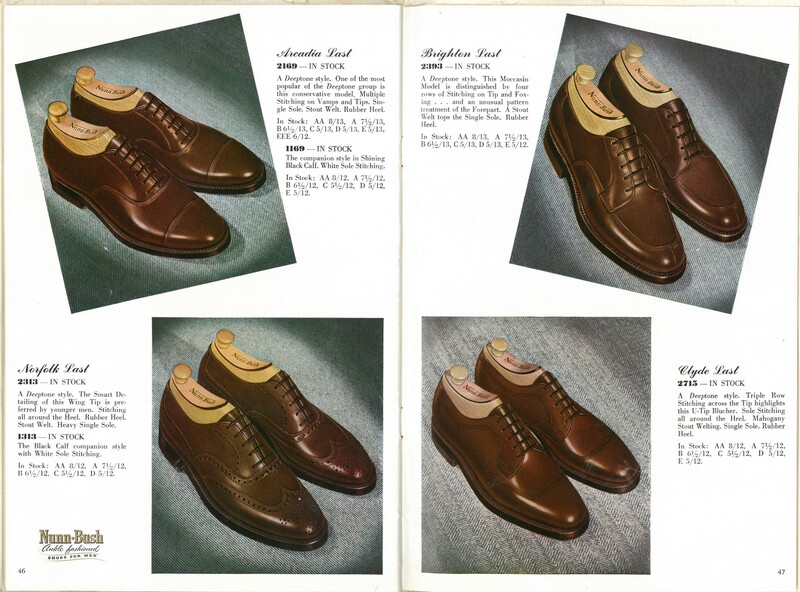 It’s a wingtip blucher with a double leather sole and split reverse (storm) welt. 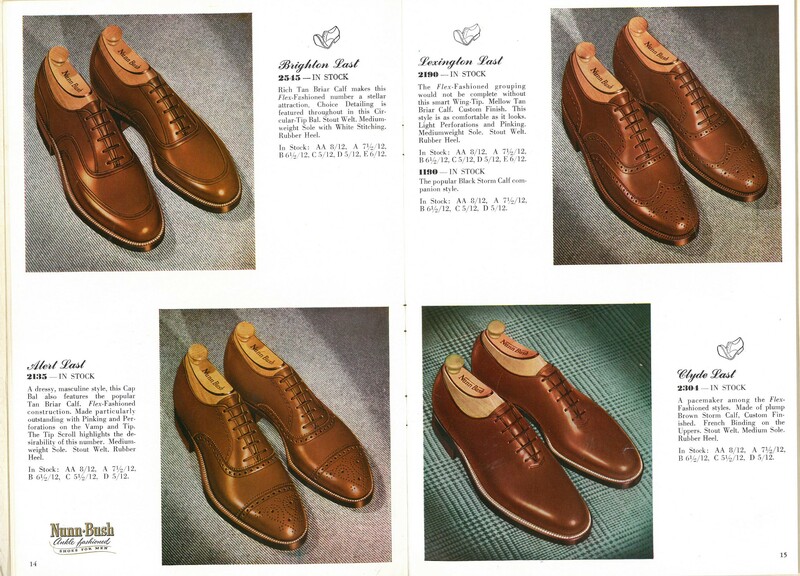 Its one of the few “gunboats” in the catalog. 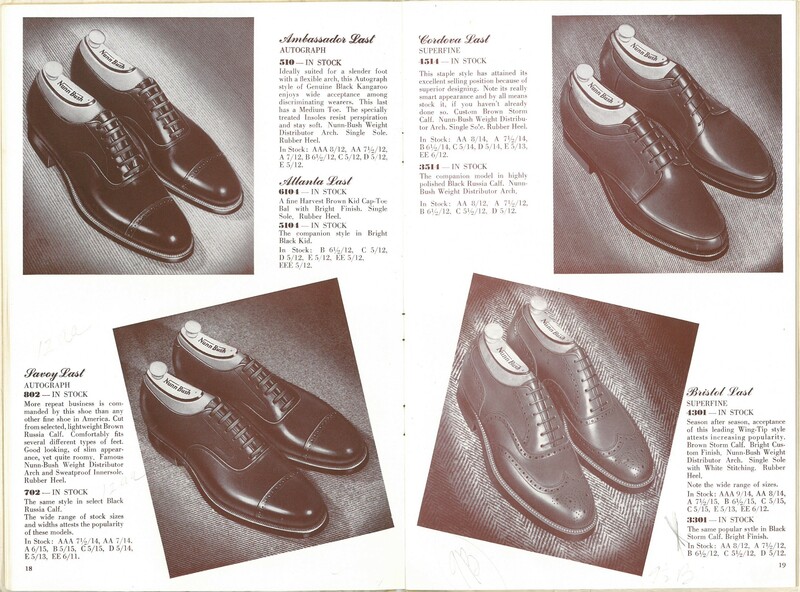 You also won’t find any loafers, boots, monks or saddle shoes in the catalog. 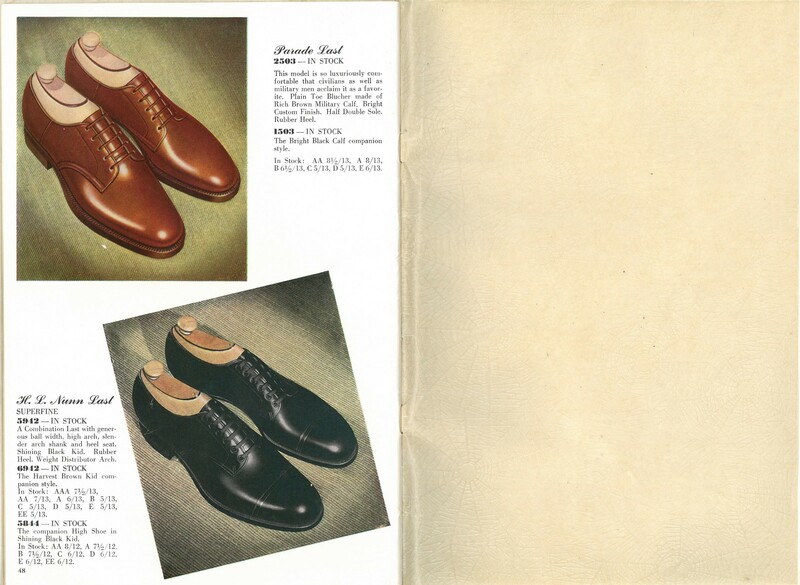 There are also no exotic leathers such as alligator or shark skin. 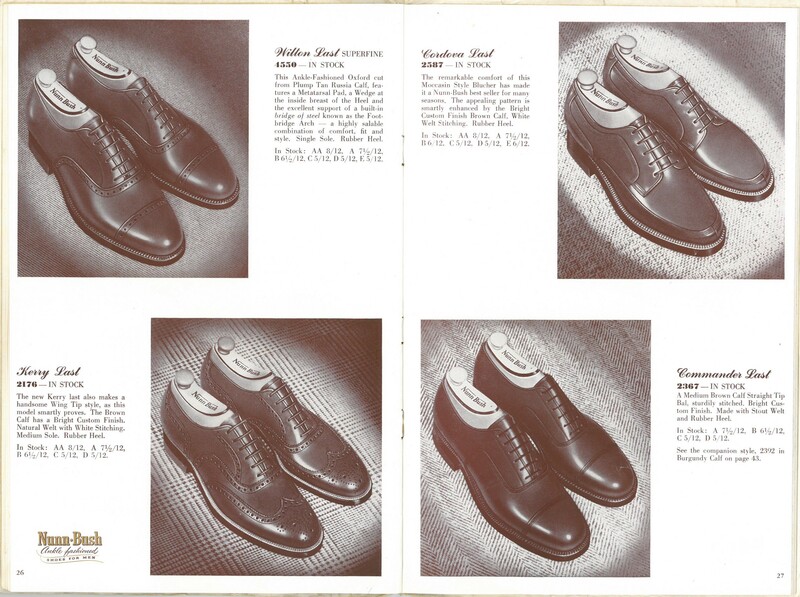 Buyers would have to wait a few more years for those. 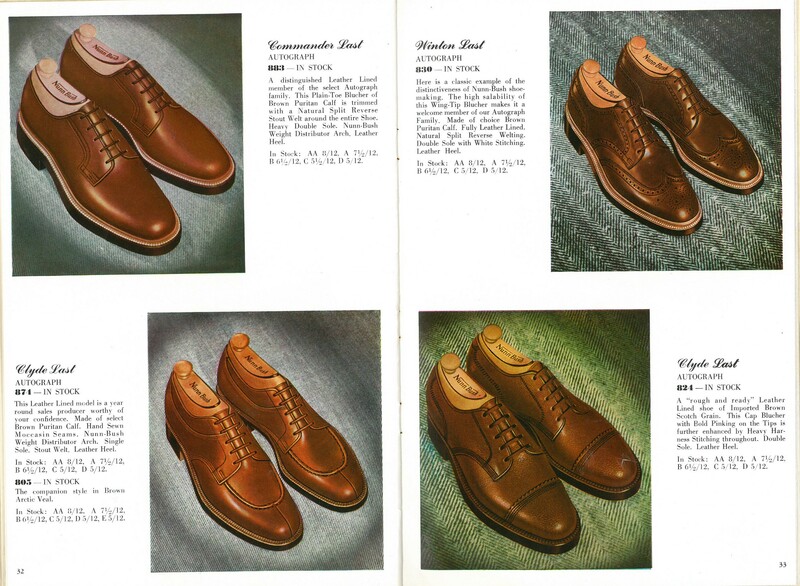 I find it interesting that there are only three models out of 86 in the catalog that come in eee width. 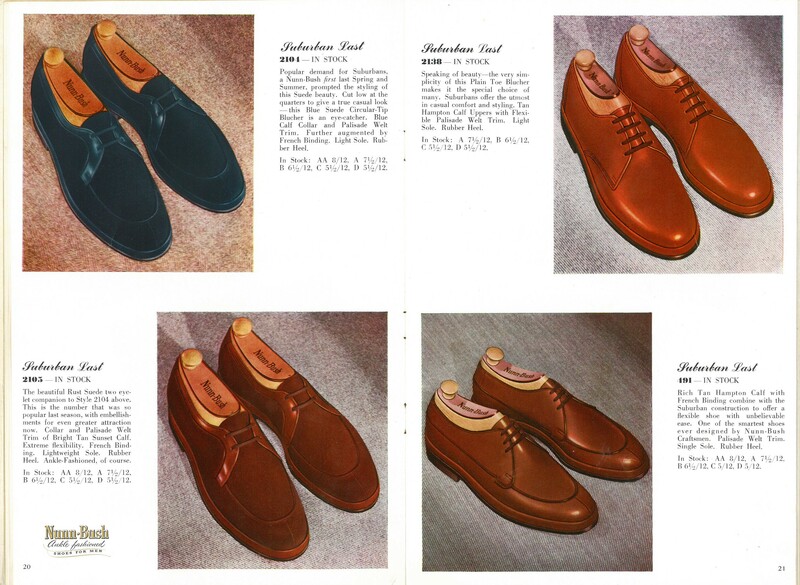 Certainly not many options in that department. 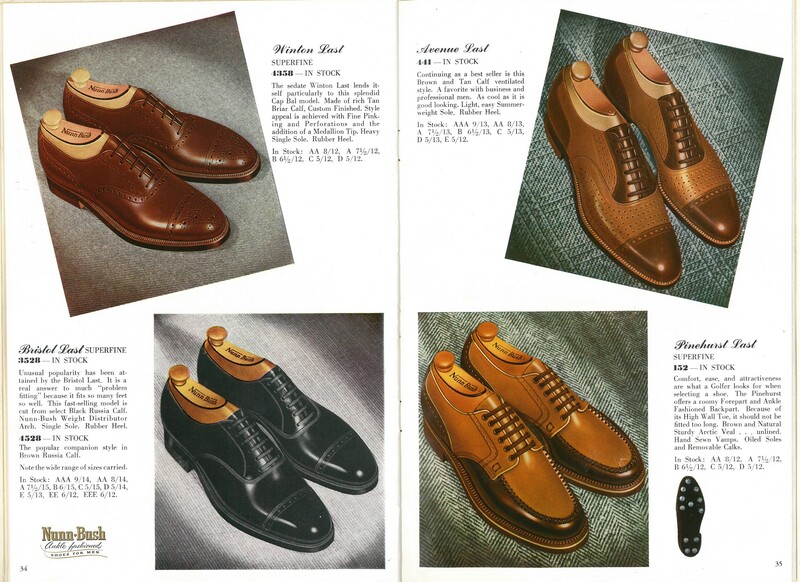 i love old vintage shoes,especially men’s shoes.i’ve got lots of them at rummage sales and thrift shops in the past and i used to put them on and not only wear them every day,usually with white socks,but i,since i never took lessons,awkwardly but jauntily tap danced in them.i love this site,it brings back memories!